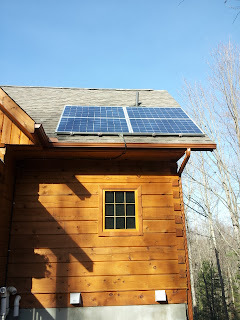 This property showcases affordable renewable energy solutions and is completely off the grid. It is an example of how technology can lessen environmental impact on the planet. Brian's home and garden are the true essence of green living. His passion and knowledge have led to the creation of Haliburton Solar and Wind, where Brian provides affordable renewable energy solutions to residents and businesses in the Haliburton Highlands. This property is an example of a 10 Kilowatt Micro FIT system which provides a steady income for the full extent of a 20 year contract with Hydro One. Although he provides energy to the hydro grid,and receives an income, he must still pay a monthly electricity bill. This property is an example of how going off the grid is attainable for individual households. 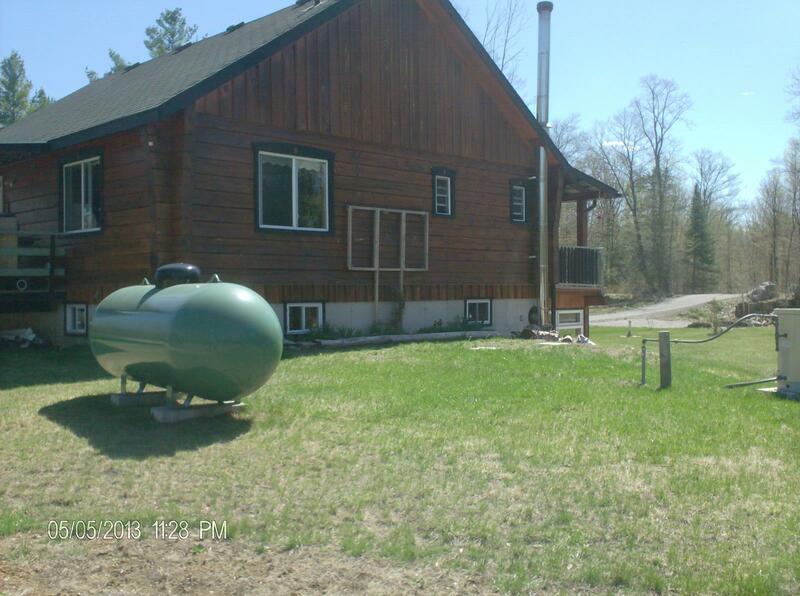 They use a combination of two wood stoves, a generator, solar panels, and propane to generate heat and electricity. 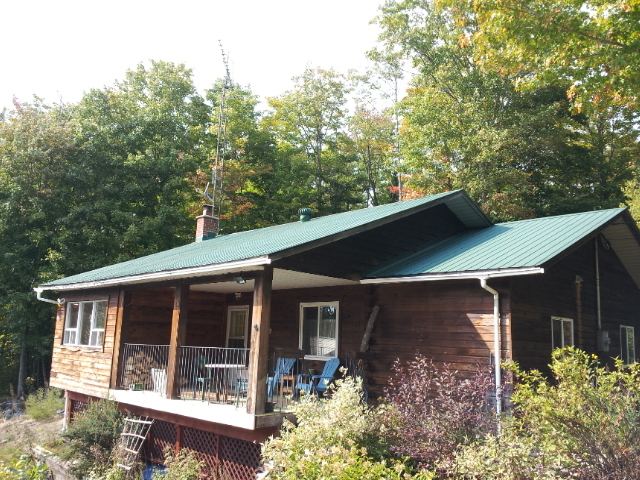 This property features an off-grid system, powered by wind turbine with a propane back up generator. 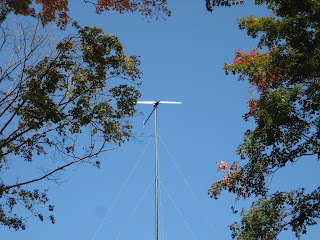 Solar panels are currently being added to the system. 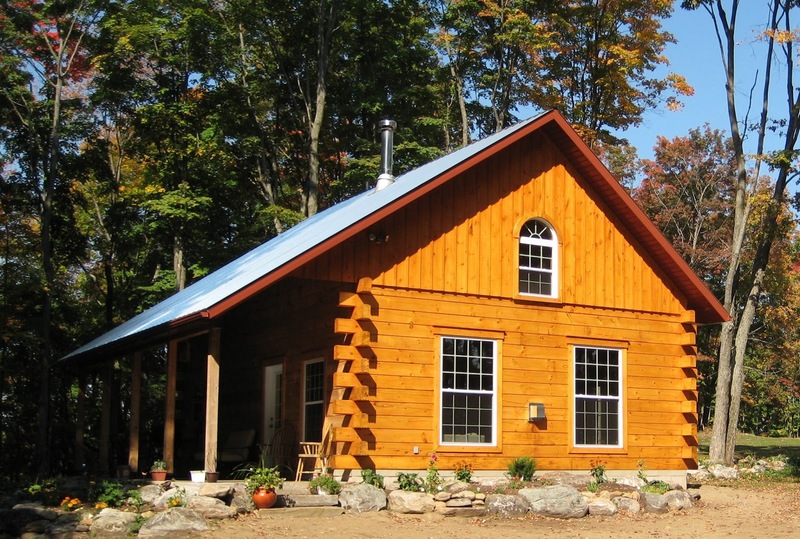 A compact, efficient design (1200 sq ft.) utilizes the benefits of passive solar. This home was built from locally harvested pine logs, which are renewable from managed forests and has incorporated reused building materials (i.e. kitchen, bathroom fixtures). 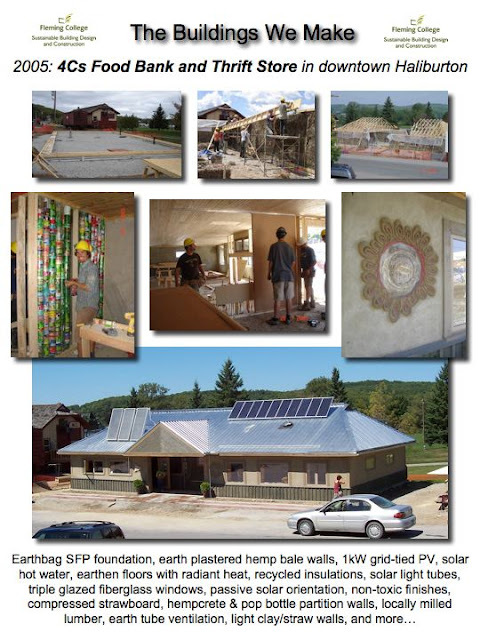 Sustainable building course is currently on-site as the building is in progress. Features include: Rain Water Collection (to be used by adjacent Community Garden) Air Source Heat Pump Four different wall systems using natural infill (Hempcrete, Straw, Blown Cellulose, Clay Straw Slip) Timber Framed (Local Timbers) Arbour with living roof Locally milled siding Natural Plasters Triple Pane Windows Passive Solar Window Alignment and as they say...much, much more. Come see an operating solar hot water heating system designed to supplement domestic hot water production all year round as well as supplement heating system in fall/winter/spring. This system runs 100% off the sun, including pumps and controls. 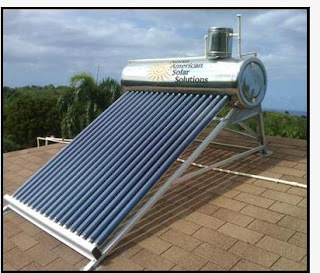 Other solar water heating systems including pool heating panels and seasonal use panels will also be on display. 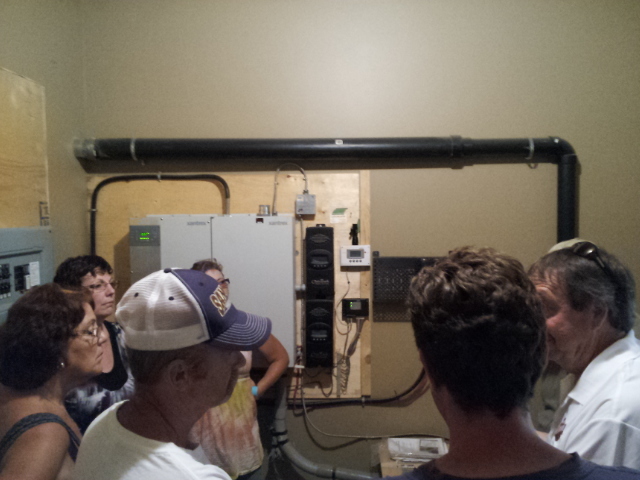 Come to the Sawmill at Haliburton Forest and see how Biochar is made! Biochar is created from leftover wood material produced by sawmills (i.e. 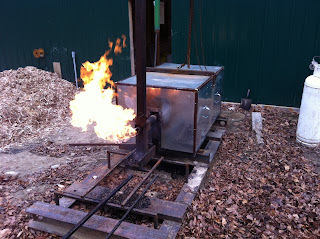 woodchips, sawdust, and bark) through a process known as ‘pyrolysis’. 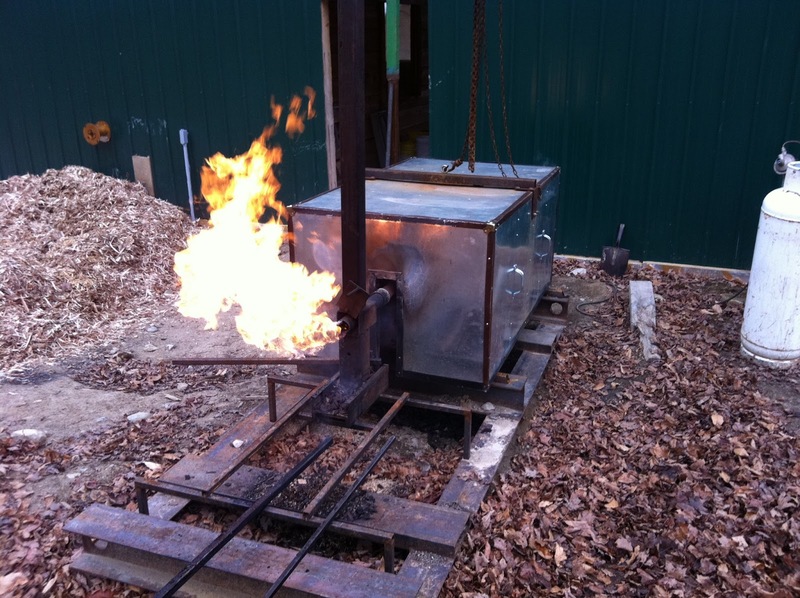 Pyrolysis refers to the heating of wood in the absence of oxygen. Biochar has proven benefits when added to soils, such as improved plant growth and carbon sequestration. Biochar-additions are being monitored in recently logged forest sites and backyard gardens. 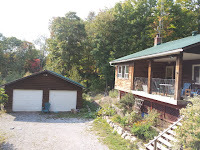 This property is an Off Grid Solar Confederation Log Home with no dependency on Hydro One. Once established there was a need to expand the system to accommodate the energy needs. 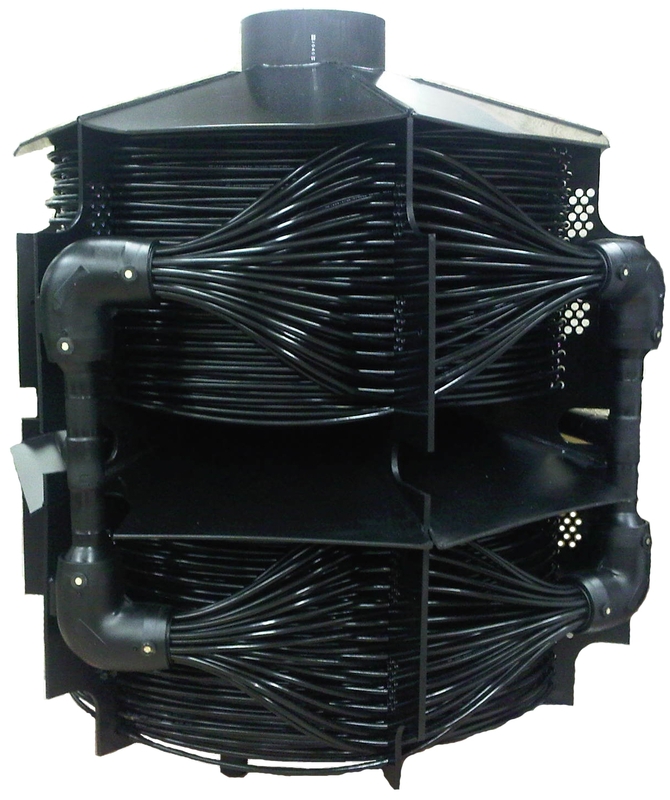 The system is now a 1.8 Kilowatt system which meets current electricity needs. 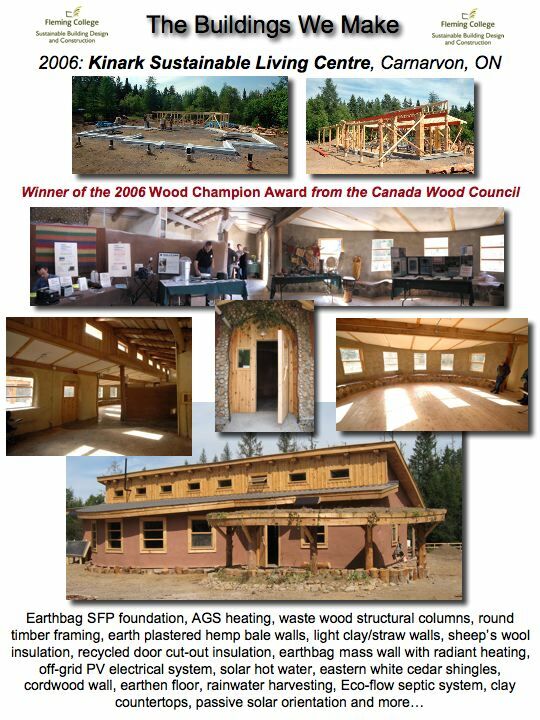 Geothermal Heating and Cooling, Radiant Floor Heating, Rainwater Collection, Living (green) Roof, Solatube Solar Light Tubes, Locally Milled lumber, Triple Glazed Inline Fiber Glass Windows, Non-Toxic Finishes, Timber Framed Entrance, Site-installed Straw bale with lime plaster finish on exterior, Clay plaster finish on interior, refabricated straw bale wall sections from Nature Built Walls Systems, Woodchip-clay infill system, Wattle and daub infill with lime plaster finish at timber frame entrance. 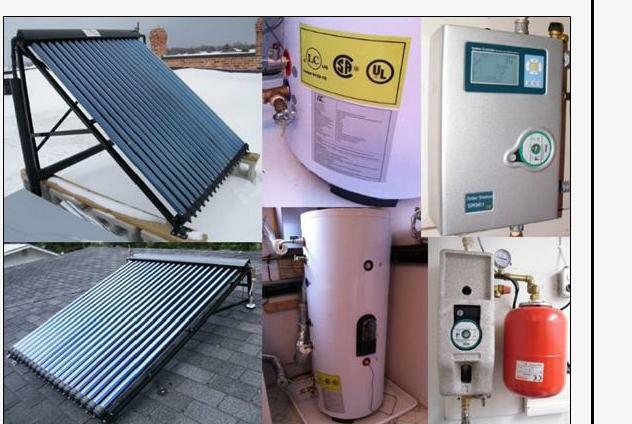 LIMNION Geothermal Transfer Systems is home to industry leading research and development of an expanding range of renewable energy products. The LIMA-1 in-water technology is a unique product which utilizes the endless supply of solar energy which moves through our lakes, rivers and oceans to heat and cool homes and buildings. We are currently constructing a world class research and development facility at our location at the Stanhope Municipal Airport Business Park. 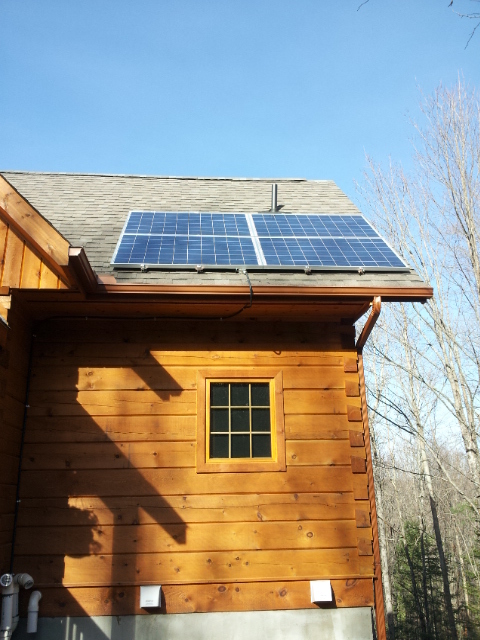 Jamie renovated his property and put in a Net Metering System. 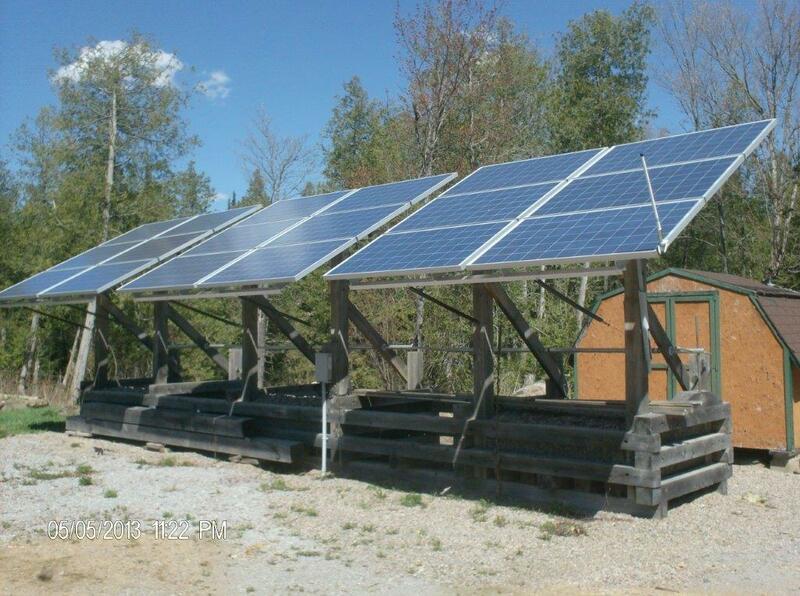 The system provides energy to the Hydro grid that can be banked for months where energy production on site is low. The net metering system reduces the dependency on energy from Hydro One and shields the property owner from fluctuations in the cost of hydro. The HCDC Green Committee consists of Directors and community representatives, who support businesses to implement green technologies, work with local municipalities and to co-ordinate and promote local initiatives. 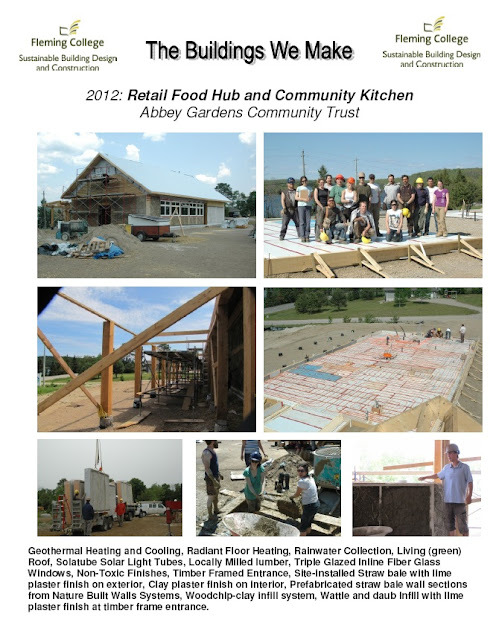 Visit www.haliburtocdc.ca for more information. ·The HCDC Green Committee is pleased to present the “Haliburton County Green Living Tour”. 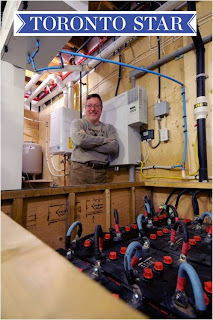 This is a self-guided tour that showcases some of the exciting “green technology” projects happening in Haliburton County. ·Pick and choose what you are interested in. Make one stop, or several stops! ·Property owners will be on-site to explain how their homes operate and provide insight into potential benefits and trouble-shooting. ·Speak to people who have done it!